Author: Elisabeth Dau, IRG. September 2017. On the initiative of the citizen platform Barcelona en Comú, the international meeting Fearless Cities (Barcelona 9th, 10th, 11th June 2017) with the credo « Cities without fear, cities of hope, cities of refuge » opened a meeting space for encounters and exchanges on the diversity of expressions of municipalism around the world. 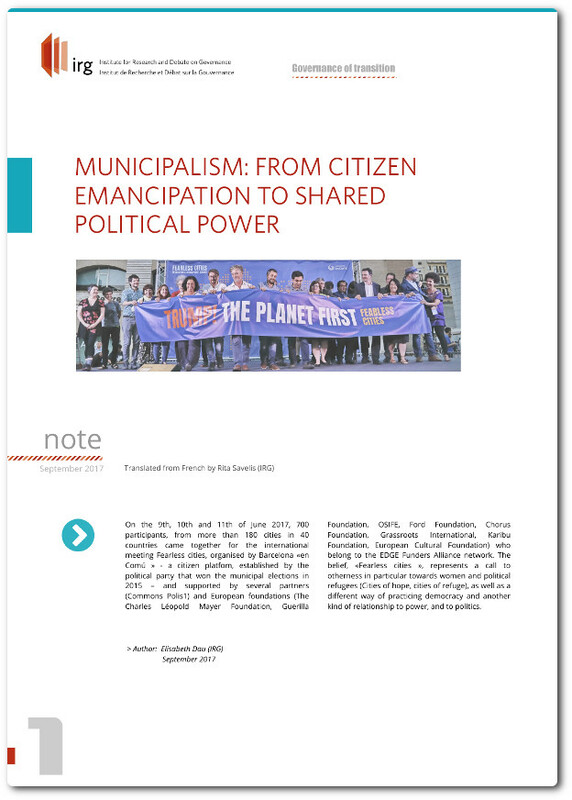 It highlighted the strength of demands for citizen emancipation, for social justice and ethics, which permit citizen movements to « win cities » and to exercice shared power. If Spain clearly stands out with election victories in several « municipalities of change in 2015 », others are emerging as well in the United Kingdom, Chile, Brazil, the United States, France… and even Kurdish provinces in northern Syria. Despite the diversity of contexts, several common features emerge from these municipalist movements. First the similarity of the crises which encourage them. A strong shared ambition has been born from them to « recreate institutions for shared management. » Responding to the needs, expectations and urgencies of populations which have been left only the indifference and injustice of an entire system, is a priority which brings back the notion of common interest and public service at the heart of municipal politics. In order to be set up, the process and tools of municipalism require a level of demand and a certain democratic radicalness. And yet, there are numerous challenges for municipalities who attempt to undertake a true change in practices and perceptions of power and politics. Despite their willingness, the stakes in participation remain uncompromising so that the results of participation do not stagnate around a too low 15%. From the inside, municipalist movements face a true challenge of structure, of change in scale and also position in the difficult passage from activism to public management. The ambition of some to move towards « non state institutions » reveals the profound battle which is taking place in opposition to the neo-liberal State and hierarchic institutions in which citizens no longer have access to the spheres of decision and suffer the injustices of a system which serves only a minority. Behind these practices of muncipalism, a genuine refounding of the municipal institution is playing out. This refounding invites us to consider differently the democracy of co-construction and the long, even slow, passage of time which it entails. It also engages each of us, elected offcials and citizens, to accept our part in the transformation. At a time when other majorities call for interventionism and withdrawal, this refounding reaffirms the necessity to be a part of a public republican space. A space which enables the encounter of collective action of social forces and public institutions to put politics back in the service of the city and its populations, in their plurality. The author thanks Vladimir Ugarte and Sergi Escribano of Commons Polis, Olivier Consolo of the Movement Utopia, Nicolas Krausz of the Charles Léopold Mayer Foundation and my colleagues from the Insitute for research and débate on governance for their attentive proofreading and their well-considered remarks.